Natural resources play an important role in the development of a nation. 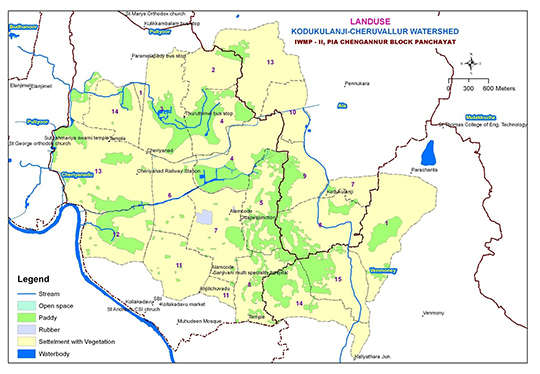 The Integrated Watershed Management Programme has been conceived to conserve, preserve and appropriately manage the watersheds included in the Chengannur Block of Alappuzha District. As the Technical Support Organization (TSO), GITPAC was entrusted with the preparation of the Detailed Project Reports following primary and secondary studies and discussions with the stakeholders, along with effective community participation. Watershed is a geo-hydrological and biological unit draining through a common point called outlet. It is a dynamic system of living and non-living things. Watershed management can be simply described as development of physical and biological elements for sustainable and self- reliant interdependence.Such a development can be achieved through a complete understanding of a system and sub-system of the watershed. Hence, the exploration of all the elements of a watershed becomes an important component of watershed planning so as to efficiently address the needs of all the dependants. The common guidelines provide a framework for the preparation of DPR under IWMP. The following methodology is adopted for the preparation of DPR under IWMP. a) Marking of watershed boundaries accurately from the ground. 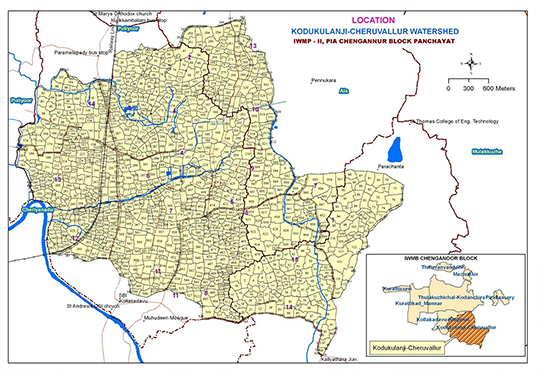 The boundaries of each watershed are marked with the help of Cadastral maps, Google maps, Watershed maps etc. The micro watershed boundaries are overlaid over cadastral map and the boundaries are corrected through ground verification. The final boundary demarcation has been done with the help of WDT and ward members. The data collection is basically done through participatory methods. The information about soil, water, biomass, agriculture situation, changes in agricultural practices etc has been collected through participatory methods. The project work starts with cadastral map of the area with all survey numbers marked. The maps have been taken to the field during PRA and all details have been marked on this map. This includes information about the location of houses in the area, characteristics of land held by the household with respect to soil, water, agriculture, income, water supply methods, floods, draughts, fire etc in the area. The baseline data collection is based on a structural questionnaire which needs to be filled by each household. Each house owner shall fill up the details of the assets, land use and land utilization, land life condition etc. Information about the socio economic condition, land ownership, survey numbers, and details of crops, fallow land area etc is also encoded. Community participation is mobilized to take part in full activities. Focus group discussion (FGD) is a good way to gather together people from similar backgrounds or experiences to discuss a specific topic of interest. The group of participants is guided by a moderator (or group facilitator) who introduces topics for discussion and helps the group to participate in a lively and natural discussion amongst themselves.Conducted FGD for farmers, Padashekara samithis and dairy farmers etc to understand the problems facing by them. The focus group discussion is preliminarily on the type of conservation methods which can be adopted for conservation of land, water, soil etc in the given region. All the data available through secondary sources were collected in the initial stages. Secondary data on, institution, NGO’s,groundwater table data, rainfall data etc were collected from the respective organizations. Maps of soil, geology, block maps etc were also collected from the concerned offices. Primary data like population, no.of houses, livestock etc were collected using structured questionnaire from the field with the help of locals and officials. Detailed site inspections of each watershed were conducted. 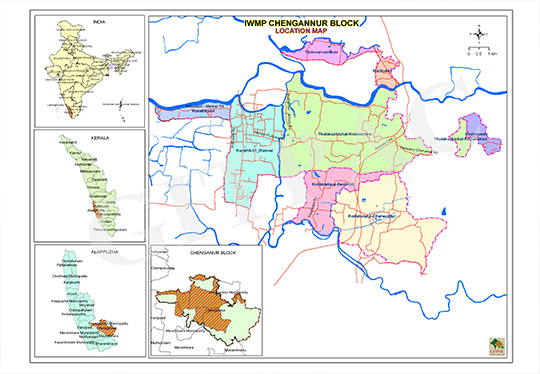 This included identification of problems, analyzing solutions which were incorporated in the proposals of each watershed. Baseline data analysis has been done through the statistical software “SPSS” and spatial Data have been analyzed using ARCGIS Software. The entry point activities were identified taking into account of potential as a model for replication. Entry point activity helps to bring rapport with the village community. Natural Resource Management activities are identified through stakeholder’s disscussions, PRA etc for each micro watershed wise and the projects are detailed out. Detailed estimation also prepared. Compiling all the above, an Integrated watershed management plan is prepared with focus to sustainability and overall development.